Shakespeare's Game of Thrones Coming in 2015! 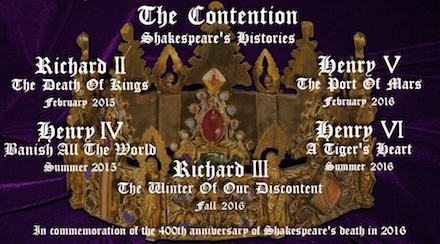 ISC is excited to announce that we are about to embark on our largest and most complex project ever: a cycle of Shakespeare's history plays, the eight-play sequence that tells a continuous story of almost 100 years of conflict over control of the English throne! Shakespeare wrote ten plays on English history, eight of which form a continuous narrative. ISC will be combining and condensing these eight plays into a series of five productions over the next two years, performed in commemoration of the 400th anniversary of Shakespeare's death in 2016. These productions will alternate between indoor shows at the Hangar Theatre and outdoor productions in the summer at Cornell Plantations. Don't let the term "history plays" fool you — these plays are as far as it is possible to get from being dry, dusty history lessons. They are the original Game of Thrones: wild, exciting, full of life and battles, radically different from one another, and featuring some of the greatest roles Shakespeare ever created — from one of his best female roles in Queen Margaret to his most fascinating villain in Richard III, and quite possibly the greatest comic character of all time in Falstaff. Interestingly, Shakespeare didn't write these eight plays in order. He wrote the last half of the story first (the Henry VI plays and Richard III) and then several years later, he went back to the beginning and wrote Richard II, the Henry IV plays, and Henry V.
We will be doing the plays in narrative order, linking them together and condensing them down to one play for each king, with as much continuity as possible from one episode to the next. When these plays were first published, the titles of some of them included some variation of the phrase "The Contention Between The Houses Of Lancaster And York." We have taken "The Contention" as the overarching title of our sequence of five productions of these astonishing plays. The play that starts it all: when the lawful king abuses his power, his cousin rises against him and takes the throne for himself...only to realize that he has opened the door for others to do the same to him. One king loses everything but finds himself, while another sows the seeds for the conflict that will engulf the nation for nearly 100 years. Tickets for Richard II will go on sale soon! Having taken the throne for himself, Henry Bolingbroke must deal with rebellions on every side...and a wild son who would rather spend his time carousing in the taverns with Falstaff than behave like a prince. The most popular of Shakespeare's plays in his own time, Henry IV combines the rowdy comedy of Falstaff, a moving exploration of the relationship between father and son, and a climactic battle between the two greatest warriors in the country. When Henry V dies and leaves his young son on the throne, the divisions in the kingdom break open and England erupts into civil war. The Wars of the Roses pit the house of Lancaster against the house of York — one led by one of Shakespeare's most formidable women, the other driven by the ominous rise of Richard of Gloucester. The Wars of the Roses are over, and England is at peace...until Richard of Gloucester begins maneuvering against his own family to take the throne for himself. Shakespeare's most fascinating villain sends the country spiraling back into civil war, leading to a final confrontation in which the living and dead alike battle for the soul of the nation.